Our review of the choose-your-own-adventure style film “Bandersnatch”. Did we just get a spoiler from today’s Funko release (or at least a confirmation of a fan theory)? We take a look at the movie we’re most looking forward to each month in 2019. Ant-Man and the Wasp spoiler free review! Ant-Man and the Wasp is an enjoyable movie, though nothing special. I feel exactly the same about it as I do about its predecessor...and for basically the same reasons. The plot and villain feel very generic and cookie cutter. I feel like I've seen this movie before many times or as an episode of a superhero cartoon. Very few of the characters are fleshed out and the stakes never seem that high. Not to say that these movies should be about the end of the world. It's actually refreshing how smaller-scale this is (ant-size you might say...sorry). However, the emotional beats are either quite cheesy (especially with the kid actors) or not allowed to breathe because they're rapidly cut off by humor. These features make it hard to find much importance in the objectives of characters. Humor is injected throughout the film, although the grand majority of the jokes caused chuckles in my audience, with few actual deep laughs. The addition of a secondary villain was quite a mistake I found because it didn't add anything to the plot and very little to the tension. 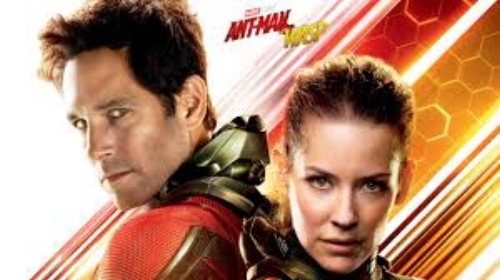 The main things that this movie has going for itself are that it doesn't take itself seriously, it has its own style within the MCU (heist), and most importantly...Paul Rudd. Paul Rudd's charm elevates this movie to be slightly above average. This is a light fun movie and one I could easily put on in the background while I'm cleaning my place. I'd give both Ant-Man movies C+. I reckon you'll enjoy this movie just as much as the previous. Hereditary marks yet another great film in the repertoire of A24. This production company just seems to keep releasing well-crafted deep films year after year! Examples include: Enemy, A Most Violent Year, Swiss Army Man, The Disaster Artist, Lady Bird, Ex Machina, Moonlight, Room …the list goes on! What’s equally impressive is that this list doesn’t include A24’s horror films (e.g., The Witch and It Comes at Night), which are just as stellar and will now be accompanied by the equal Hereditary. Any film A24 releases is one that I now pay attention to. I can’t say that about any other movie company. Hereditary is a masterly-directed film with superb acting that leaves you haunted with its unsettling themes and imagery. Right from the start, the movie’s camerawork and editing successfully create this creepy tone to be sustained for the grand majority of the running time. One of the things that I love most about this movie is that even the most mundane sequences in the film had me anxiously awaiting something dreadful. This is a director that knows how to create suspense and tension…and it’s his directorial debut! Ari Aster I’m going to be keeping my eye on you. Gosh the way Aster filmed ghostly threats in dark corner backgrounds is amazing! The actors that play the four family members all give performances that are just top notch. Special recognition has to go to Toni Collette, who conveys such extreme emotions in a believable and captivating way. I hope she’s recognized by many award programs. The film explores the theme of demons being passed on between generations through the concepts of mental illness, family dynamics, the supernatural, and spiritualism. Those are all hard concepts to balance in one movie, but it’s done so well here. I think the one minor complaint I have is that the third act has some heavy expositional moments that I think clash with the rest of smoothly symbolic and atmospheric scenes of the movie. The pacing is slow and the scares are not those of typical mainstream horror films. Therefore, this movie isn’t for everyone. However, I think the slow-burn is fitting for this disturbing and creepy story. Since the movie is about cursed generations, the best analogy I can give is that if The Shinning and Rosemary's Baby had a child in the 21st century, it would be this film. A- from me. What did you guys think?! I struggled to turn off the lights when I went to sleep last night haha especially since some of the creepiest scenes involved dark forces in the background of a bedroom at night! I've seen Solo: A Star Wars Story twice now, and I can safely say that I consider it to be an OK film, a C+ on the Fresnerd grading scale. Not bad, yet not good either. I gave the same grade to Episode III: Revenge of the Sith. The film feels more like a series of events, rather than a meaningful story. It doesn't present any depth to the characters and it doesn't further our understanding of the iconic Han Solo as a person. This is especially the case since he doesn't go through any clear arc. In fact, he stays pretty much the same 'good guy' whose charm pales in comparison to the other characters (most notably Lando). This also contradicts the scoundrel persona we know and love at the beginning of Episode IV: A New Hope. That being said, it was still an enjoyable time at the theater. The action sequences are fun enough and the style and look of the world felt very Star Wars. Plus, I gave a loud geeky squeal with the ending's twist reveal (no spoilers here). Now even though I didn't think it was a great film, I still love the fact that it exists! I'm so happy that we live in a world where Star Wars movies are being made. This is an incredible universe that has changed not only cinema, but also the lives and imaginations of so many people around the world. It is in that spirit that we should continue to support these movies, the people involved, and other fans as well. Sure, everyone is entitled to their opinions on whether they like or don't like a certain Star Wars movie (I have plenty on both ends of the spectrum), but they should never be expressed in such a disrespectful manner that contradicts that very values conveyed by those stories or that insults the dignity of the others (creators and fans). It saddens me to see such loud hate by certain extreme fans against Star Wars movies that don't go the way they want, aren't as good as they want, or have characters they don't like (even for their race or gender). This hate started with the prequels and is still evident with the modern Disney films. Such hate had clear harmful effects on the spirits of many people, most notably: George Lucas himself, Jake Matthew Lloyd (kid Anakin), and recently Kelly Marie Tran (Rose in the Last Jedi). So many have gone after Rian Johnson because of his controversial The Last Jedi. This is wrong and not in line with what Star Wars stands for. To quote Yoda: “Fear is the path to the dark side. Fear leads to anger. Anger leads to hate. Hateleads to suffering.” I hope that true Star Wars fans can unite in a such a way that peacefully quiets this small hateful minority as an example to the world of supportive fandom. I hope all Star Wars fans when voicing their opinions on these movies will ask themselves, "Would Luke or Yoda express themselves in such a way?" We at The Fresnerd are celebrating Star Wars Day by looking back at some of our favorite moments from Star Wars! Who Will Die in "Infinity War"? The Fresnerd Staff Weigh In. The movie that is a decade in the making is nearly here! And there will be blood spilled. The Fresnerd staff debates who will live and who will die in Infinity War.